Famous artworks get new limbs, Winona Ryder dances with Elizabeth Olsen for H&M, and The Rock gets hyped up for his new collection with Under Armour. It’s a bit tough to figure out just what the German corporation Metro AG actually does, considering it has its hand in everything from food retail and distribution, to real estate and logistics. What isn’t hard to understand is its “Own Business Girls” campaign initiative. In a recent study, the company found that 45% of women dream of starting their own business, but only 12% think it’s actually possible, with 50% citing a lack of financial support. So to mark International Women’s Day (March 8), the company pledged to give every girl born on March 8 in the city of Dusseldorf startup funding worth 2,000 euros, to be invested in a fixed-term deposit with an annual 2% interest rate, and accessible when they turn 18. Onward! What: A German campaign for International Women’s Day that gives newborn girls a start in their entrepreneurial goals. Why we care: To put it plainly, this is one campaign that puts some money where its mouth is on an important issue. What: A campaign to raise awareness for the need for affordable prosthetic limbs–particularly in developing countries–decided to outfit some of the most famous amputees in the world. Why we care: There are millions people around the world in need of artificial limbs, and Handicap International develops prosthetics using 3D printing to accelerate access for thousands of war victims stuck in dangerous or inaccessible zones. This campaign cleverly takes something incredibly recognizable–the statues and artwork around Paris–and uses it to shine a spotlight on a lesser known issue. What: A stylish, tango-flavored dance number featuring Elizabeth Olsen and Winona Ryder, to promote the retailer’s new collection. Why we care: Winona! Okay, so this isn’t exactly H&M’s first celebrity-filled rodeo. But it’s a fun one that definitely has the brand’s marketing department praying it will help people forget its idiotic racist sweatshirt debacle. What: Dwayne Johnson’s new ad for the latest line of gear in his ongoing Project Rock collaboration with Under Armour. Why we care: Is it groundbreakingly creative? Nah. Something we’ve never seen before? Nope. But it’s still probably the perfect way to roll out this new collection. A personal message from The Rock, it echoes the GET SOME motivational messages around hard work and perseverance he sends out to his tens of millions of social followers every day. 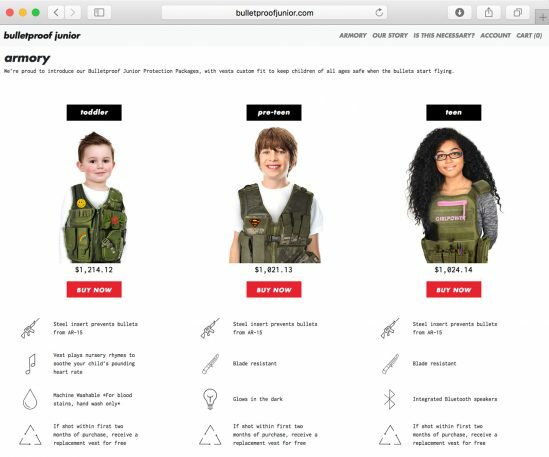 What: To help mark this weekend’s March for Our Lives in Washington, D.C., this fake e-commerce site called Bulletproof Junior launched to raise awareness and lobby politicians to take action on gun control and safety legislation. Why we care: A line of bulletproof vests to protect your little ones against the next inevitable school shooting? The toddler version plays nursery rhymes to soothe a child’s pounding heart rate, the preteen vest is blade resistant and glows in the dark, while teen version features integrated Bluetooth speakers. Thankfully, this is as fake as so many of the thoughts and prayers issued from Washington, D.C. Once you hit the buy button, a message pops up with the reveal. You can enter your zip code to automatically aim a tweet at your local U.S. senator, sign up to vote, donate blood through the American Red Cross, or donate to March for Our Lives.